BEFORE: Not much to say here. Let’s just get things underway. Pressing play… now. AFTER: Well Volume 2 was certainly not what I was expecting. There happened to be much, much less unrealistic gore and less of the highly stylized look of Volume 1. There were still plenty of fight scenes, but they were much more subdued while maintaining a high level of exhilaration and excitement. But the fighting wasn’t the biggest part of Volume 2; that’s left to the story. We find out why The Bride has such a vendetta against Bill and the rest of the assassins, how exactly everyone is so good at martial arts and sword-fighting, and who Bill really is. Basically, it’s a bunch of history lessons, fun history lessons, on all the characters teaching you who they are, how they got here, and where they’re headed. 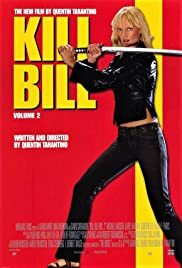 In other words, Kill Bill: Volume 2 gets rid of the bad parts of Volume 1 and supplies an all-you-can-eat buffet of the good parts.